Living Small. How The Tiny House Movement Found Me. By Brad Beckstrom AKA The Frug. Sometimes it just takes a few pioneers to get a movement started. These early adopters often do things in the extreme, they set benchmarks. For example, last week I met Dee Williams. Dee spoke at WDS in Portland Oregon about selling her three-bedroom home and building an 84 square ft. tiny house. She spoke about her discovery of the tiny house movement. In her presentation, Dee didn’t spend a lot of time on architecture or zoning. It was really about her 10 year journey towards a leaner lifestyle. It was more about how living in a tiny home helped her spend more time in the community, get to know her neighbors, and learn how to build something. It wasn’t just a house she was building, it turned into a small business called Portland Alternative Dwellings and later a book The Big Tiny. There’s something deeply appealing to me about smaller dwellings. Maybe it’s Dee’s eight dollar electric bill or zero property taxes. But, more likely, it’s just a simplified lifestyle. See the thing is, I don’t live in a tiny house. We have a rug in our family room that’s bigger than 84 square feet. If you read this blog, you’ll know that I’m on a quest to simplify my life and get rid of excess stuff. In this quest, the Tiny House Movement found me. Simple, modern, prefabricated houses started popping up in Dwell Magazine years ago. Then I read about a project at Auburn University where students were challenged to design homes that could be built for $20,000. I dug a bit deeper and started following the Tiny House Blog. Then the Tiny House movie showed up on Netflix. Tiny: A Story About Living Small. Then a TV series: Tiny House Nation. Suddenly tiny houses are everywhere. It turns out that completely rethinking the home is sort of a big deal. As the world population grows and energy costs go up, it becomes more important. 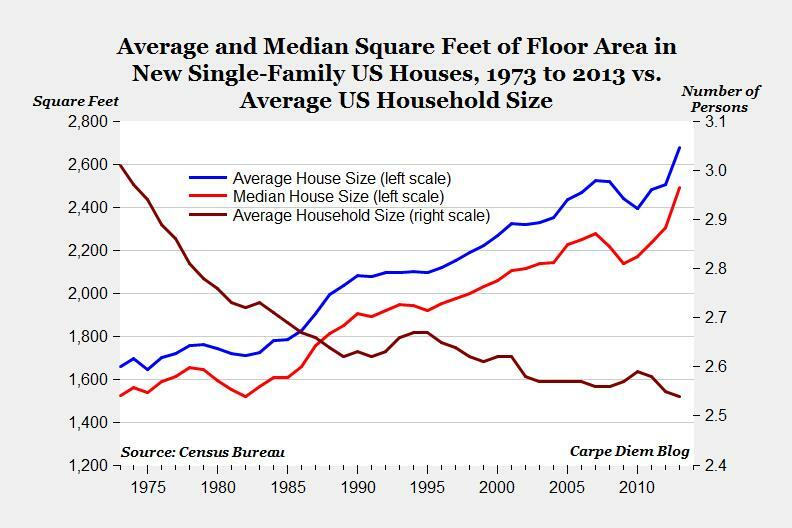 Here in the US with room to spread out, homes just grew and and grew until they reached their current super sized proportions, even by our own standards 40 years ago. The average amount of living space per person in a new home has nearly doubled since 1973. So, like many movements, people can interpret it in their own way. For me, I’m looking five years down the road. Kids headed off to college, traveling more, living lean, there are some things I can start doing now to make sure a smaller home will fit my family’s future needs. Here are some things I’m doing to see if there is a tiny house in my future. Follow some Tiny House blogs, gather some information, and look at what the innovators and outliers in the Tiny House movement are doing. I don’t think I’ll ever see us in an 84 square foot home, but some of the efficiencies that these pioneers have found could apply to many different types of properties. What are the financial benefits of living small? Much like getting rid of large vehicles and long commutes, the numbers can really add up. No mortgage, lower maintenance, lower utilities, lower property taxes. How can a smaller home impact where you live? I’ve always wanted to live on the water. As it turns out, there’s some fantastic tiny homes that float. Now that’s on the water. How much stuff do we need to get rid of over the next five years if I want to live in a home that’s 50% to 60% smaller than the one I’m in now. I’ll explore many of the prefabricated options and the possibility of having one of these Tiny Homes built or delivered on the back of the truck. I will use Evernote to capture design elements of tiny homes, and other highly energy efficient homes, to get a solid feel for what works for our family. Where would I want to build this tiny home? The smaller footprint has many advantages and can greatly impact the size of the lot and the zoning I’ll be looking for. Visit some tiny houses. It turns out that tiny houses aren’t just for cabins in the woods. There is a whole community in DC boneyard studio that opens up their tiny houses to visits. Think about the interior space and how it will function. What rooms in our current home get the least use? Decide what we really need. What type of energy efficient options like wind or solar power will be even more affordable in the next five years. Search for some tiny houses on airbnb. Stay for a weekend or more to get a feel for that lifestyle. As I was putting this list together, I realized there are a lot more than 10 things to do in moving towards a smaller footprint. A big one might include optimizing a home for house sharing, international house swapping, airbnb rentals. Can a home or property be self-sufficient with no mortgage? How will this impact the design, the zoning, etc.? Here are a few resources I found helpful in this quest. I’ll also share some of my alternative dwelling inspiration in this slideshare. If you find some additional sites or great resources please share in comments. I love this idea and I kind of started doing it 9 yrs ago when I moved from 3,000 sf to 1,400. I don’t miss the sf! You should also check out making homes out of shipping containers. They’re building an apt house out of 18 containers in my neighborhood in DC right now. Very cool concept and it keeps them out of the landfill! Cool, I heard about that. I need to check it out. Hey, just found your site while searching for some Tiny House info, read your post here and thought I would pass along our YouTube channel. We are in the process of a tiny house build on Vancouver Island and are documenting the build in as much detail as we can. We both have never built anything like this before so we are sharing all of our experiences such as cost, issues that we have come across so far etc. Check it out if you are considering building yourself! Thanks for sharing I will check it out. Best of luck with your project!